The Australian built Daring Class destroyers were similar to the vessels of the Royal Navy’s Daring Class but were modified for Australian conditions. HMAS Vampire commissioned at Sydney on 23 June 1959 under the command of CAPT Eric J. Peel DSC RAN. In early 1970 Vampire was involved in junior officer’s training plus goodwill visits to Adelaide, Brisbane and Lord Howe Island. This was a prelude to her paying off on 29 June 1970 to undergo an extended refit. This half-life modernisation, which took until November 1971, saw Vampire receive new gun turrets and fire control systems, new aircraft warning and navigation radar, plus replacement of a major portion of her superstructure. 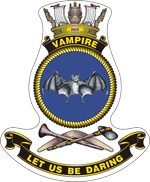 Vampire recommissioned on 17 November 1971 under the command of CAPT G.J.H. Woolrych RAN at Dockyard Pier, Williamstown, and conducted work-up trials before arrival back in Sydney in March 1972. A trip to New Zealand was undertaken in August before her first Far East deployment in her new guise from October 1972 until March 1973, during which she participated in the SEATO Exercise SEA SCORPION. In April 1973 Vampire visited Suva and Apia and hosted the Australian Prime Minister during the South Pacific Forum. In September Vampire participated in Exercise LONGEX 73 and visited New Zealand. In June and July 1976 Vampire visited the west-coast of America, calling at San Francisco and Seattle before returning home in August via Hawaii. The remainder of 1976 and early 1977 were occupied with maintenance, leave periods and local exercises. A visit to New Zealand was the only deployment during 1978, due to further refitting between May and August. Post refit trials and work-ups completed the year. 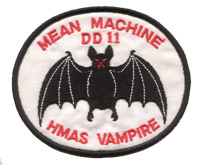 Vampire commenced a South East Asian deployment in January 1979 and visited Singapore, Madras, Colombo, Belawan, Manila, Subic Bay, Hong Kong and Japan before returning to Sydney via Guam in June 1979. Participation in Exercise KANGAROO THREE completed the year and her arrival in Sydney on 6 December 1979 marked the end of Vampire’s operational career. The Royal Australian Navy’s 75th Anniversary was a fitting year to mark the end of Vampire’s career. In April 1986 a decision was made to decommission her, and after a final cruise to Cairns, Townsville, Suva, Apia and Auckland, Vampire made a ceremonial entry in to Sydney on 24 June 1986. The following weeks were spent preparing the ship for decommissioning. 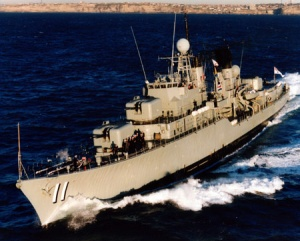 The last of the Australian Daring Class destroyers paid off on 13 August 1986 after a 27 year career during which she steamed 808,026 nautical miles. On decommissioning Vampire was gifted to the Australian National Maritime Museum where she continues to be a popular tourist attraction for overseas visitors and former members of her ship’s company.